Begin in Amsterdam, with its legendary canals and distinctive architecture. Visit the majestic cathedral in Cologne, the university town of Heidelberg, medieval Strasbourg and the Black Forest region before concluding your cruise in Basel, Switzerland. Meet your fellow travelers tonight at the Welcome Dinner. The famous canals of Amsterdam await discovery on your city tour. 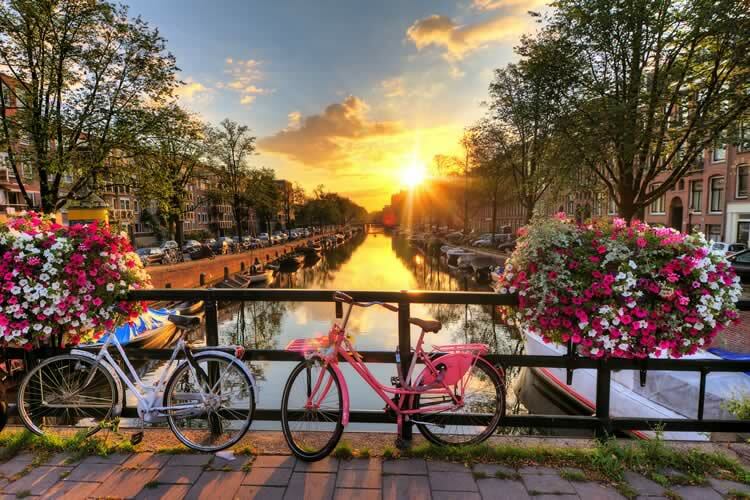 Begin with a scenic canal cruise and see the tall narrow homes lining the water, the Skinny Bridge, and the house where Anne Frank and her family lived in hiding during WWII. Next, you’ll walk to Begijnhof, known for its historic buildings dating back to the Middle Ages and have some free time to explore. Later, enjoy a panoramic city tour on which you’ll see the Royal Palace, Westerkerk and stop for photos at a Dutch windmill before returning to the ship. This afternoon depart for Germany. Your guided tour of Cologne this morning includes the Old Town, Cathedral Square, and the city’s majestic Gothic cathedral. As an alternate option enjoy a Kolsch beer tasting or join a more active bike tour. Afterwards, you’ll have free time to visit some of the local shops or have a coffee at a quaint café. This afternoon the ship cruises to Koblenz and moors overnight. This morning, cruise through the picturesque Rhine Gorge, admiring its many castles and fortress ruins and the legendary Lorelei Rock. This afternoon you will arrive in the winemaking town of Rüdesheim where you will have the option to take one of three excursions: wine tasting with a local vintner, a gondola ride above the town to see the Niederwalddenkmal Statue, or a guided bike tour along the Rhine River to one of Germany's best wine regions. Later you’ll have free time to explore the Drosselgasse, the town’s most famous and charming street, a narrow passage lined with shops and taverns. This evening, visit Siegfried’s Mechanical Music Museum, home to a remarkable collection of old robotic and self-playing musical instruments, or join us for some Rüdesheimer Coffee. The ship sails overnight. Arrive in Mannheim, where you have a choice of one of three excursions this afternoon. Your first option is a half-day excursion to the historic university town of Heidelberg, where you will visit the red-walled castle with its Great Vat (a 49,000-gallon wine cask) and enjoy beautiful views of the Neckar Valley and city below. Or, for your second option, enjoy a hike up the Philosopher's Path to a panoramic view point of Heidelberg. Your third option is a city tour of Speyer one of Germany’s oldest cities, is known for its cathedral, numerous churches and the medieval Altpörtel (Old Gate). 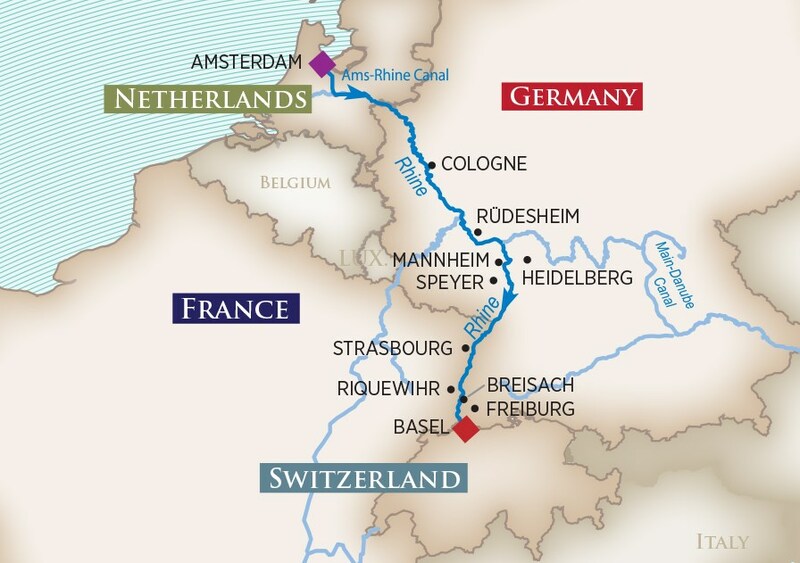 This evening, the ship continues onward to Strasbourg, France. .
Capital city of France’s Alsace region, Strasbourg is situated on the Rhine at the German border. After arriving this morning, enjoy either a panoramic bus tour or guided bike tour that will take you past the Orangery, the town’s oldest park, the European Parliament and the Place de la Republique. Afterwards, explore on foot with a walking tour of the lovely “La Petite France” neighborhood, where you will see the Gothic cathedral with its famous astronomical clock. You also have the option of exploring Strasbourg on a guided hike that begins at the Orangery and makes its way to the cathedral. The remainder of the day is yours to spend as you wish before the ship departs tonight. You have three exciting excursions to choose from today. The first is a walking tour of Riquewihr, a picturesque town renowned for its historic architecture and for its Riesling wines. A second option is a tour of the beautiful towns of Breisach and Freiburg, where you will visit the historical city center and Freiburg’s Münster, a Gothic cathedral constructed of red sandstone. Your third choice is guided bike tour of Breisach that takes you through the Rheinau woods. Tonight, the ship cruises towards Switzerland. Savings of up to 25%! Terms and conditions apply. All offers are subject to availability and operators booking conditions. Prices are based on two passengers sharing the lead in grade stateroom unless otherwise stated. All discounts have been applied to fares displayed. Fares and offers are subject to availability and may be changed or withdrawn at any time. Fares do not include flights or transfers. Flights are available on request, please call for details. Savings of up to 25% is valid to new booking only made after 1st March 2019 and applicable on selected European and Asia 2019 only. We charge a one-off small £20 booking fee. That’s it - nothing more and no add ons when you pay the balance. E&OE. ABTA P6710.